Tightening must be done following the installation procedure. Refer to TM-283, "Removal and Installation". Do not remove the radiator cap when the engine is hot. Serious burns could occur from high-pressure coolant escaping from the radiator. Wrap a thick cloth around the cap. Slowly push down and turn it a quarter turn to allow built-up pressure to escape. Carefully remove the cap by pushing it down and turning it all the way. Perform these steps after the coolant temperature has cooled sufficiently. Before replacing TCM and transaxle assembly as a set, perform "ADDITIONALSERVICE WHEN REPLACING TCM AND TRANSAXLE ASSEMBLY". Refer to TM-144, "Work Procedure". When removing components such as hoses, tubes/line, etc., cap or plug openings to prevent fluid from spilling. When replacing the TCM and transaxle assembly as a set, replace the transaxle assembly first and then replace the TCM. Refer to TM-142, "Description". Remove the engine and transaxle assembly. Refer to EM-82, "M/T : Removal and Installation" (MT) or EM-86, "CVT : Removal and Installation" (CVT). Disconnect the connectors and harnesses. 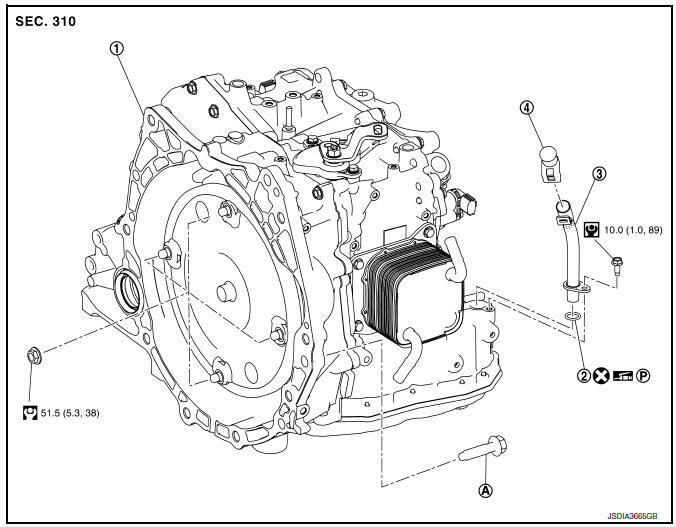 For CVT unit harness connector, refer to TM-69, "Removal and Installation Procedure for CVT Unit Connector". Rotate the crankshaft and remove the nuts that secure the drive plate to the torque converter from the stator motor mount. Rotate crankshaft clockwise (as viewed from the front of the engine). Remove the bolts (engine to transaxle) that fasten the transaxle assembly and engine assembly. Lift the transaxle from the front suspension member. Do not reuse O-rings or copper sealing washers. When tightening the nuts for the torque converter while securing the crankshaft pulley bolt, be sure to confirm the tightening torque of the crankshaft pulley bolt. Refer to EM-49, "Removal and Installation". After converter is installed to drive plate, rotate crankshaft several turns to check that CVT rotates freely without binding. Install the transaxle assembly and engine assembly mounting bolts according to the following standards. 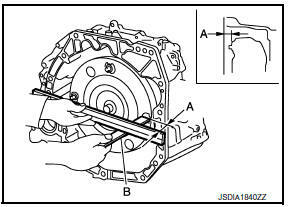 Check the dimension (A) between the converter housing and torque converter. Dimension (A) : TM-289, "Torque Converter"
CVT fluid leakage. Refer to TM-250, "Inspection"
For CVT position, refer to TM-150, "Inspection". Start the engine and check for coolant leakage from the parts which are removed and reinstalled. Adjust the CVT fluid level. TM-251, "Adjustment". Perform вЂњADDITIONAL SERVICE WHEN REPLACE TRANSAXLE ASSEMBLYвЂќ. Refer to TM-144, "Description".